26 December 2016 / January 2017 Elearning! BY CLAIRE JOHNSON By 2025, 46 percent of the workforce will be Millennials. According to a report from the National Chamber Foundation, Millennials expect close relationships and frequent feedback from management, viewing their managers as coaches or mentors. eir managers — rather than the corporations themselves — can earn the loyalty of Millennial employees by keeping their word. Management can reduce the risk of Millennial employees leaving a company by maintaining a positive relationship with them. Findings indicate that the main reason that this age group leaves a company is directly related to a superior. At Express, the future is about those Millennials. "We structure our learning and development for them," says Adam Zaller, Vice President of Organizational Development, Express. "e average age at Express is 27, and at the retail stores it is middle to low 20s." Realizing this, Express identified an opportunity to evolve its talent management strategy for its primarily Millennial-aged employees while becoming a fashion authority for both men and women. According to Zaller, "[Millennials] are always connected, multi-taskers who are very socially aware. ey have more friends ... two-and-a-half times more than Boomers. Because of this, they are influenced by their peers; they seek status among the peer group; they tend to 'crave experiences.' In our development programs, we focus more on the experiences and activity and less on the classroom or the course." To support this culture, Express's organizational development team created an intuitive, irresistible, social and mobile learning experience for its more than 22,000 mostly-Millennial employees. e program has pushed limits and established an engaged employee population that's driven customer experience scores and internal engagement scores to their highest levels while decreasing turnover to its lowest rate ever during the three years that it's been implemented. "It's Uber personalization and individualization," continues Zaller. "It's not one size fits all. Simplicity is king, and experience and activities are paramount to actual courses. And most importantly, it's all about smartphones." How does this translate into learning and development? Millennials wants more communication. "Everyone has that one thing they are phenomenal at … provide them a talent management framework so they can socialize that," suggests Zaller. THE EXPRESS TALENT DEVELOPMENT PLAN At Express, all training programs are designed to organizational competencies. 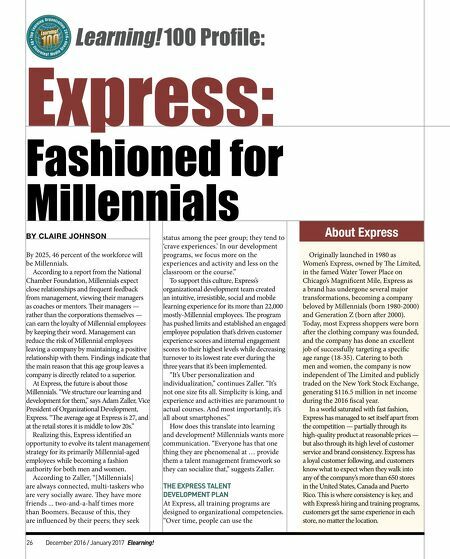 "Over time, people can use the Express: Fashioned for Millennials Learning! 100 Profile: About Express Originally launched in 1980 as Women's Express, owned by e Limited, in the famed Water Tower Place on Chicago's Magnificent Mile, Express as a brand has undergone several major transformations, becoming a company beloved by Millennials (born 1980-2000) and Generation Z (born aer 2000). Today, most Express shoppers were born aer the clothing company was founded, and the company has done an excellent job of successfully targeting a specific age range (18-35). Catering to both men and women, the company is now independent of e Limited and publicly traded on the New York Stock Exchange, generating $116.5 million in net income during the 2016 fiscal year. In a world saturated with fast fashion, Express has managed to set itself apart from the competition — partially through its high-quality product at reasonable prices — but also through its high level of customer service and brand consistency. 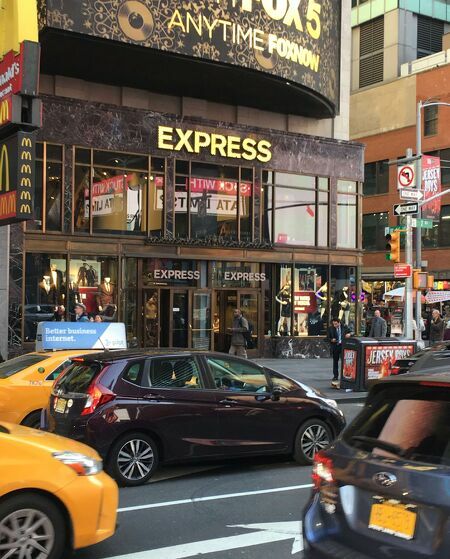 Express has a loyal customer following, and customers know what to expect when they walk into any of the company's more than 650 stores in the United States, Canada and Puerto Rico. is is where consistency is key, and with Express's hiring and training programs, customers get the same experience in each store, no matter the location.